This new M600 will have an orange marbled barrel made of a brilliant acrylic that harkens back to the Orange M320 from 2004. 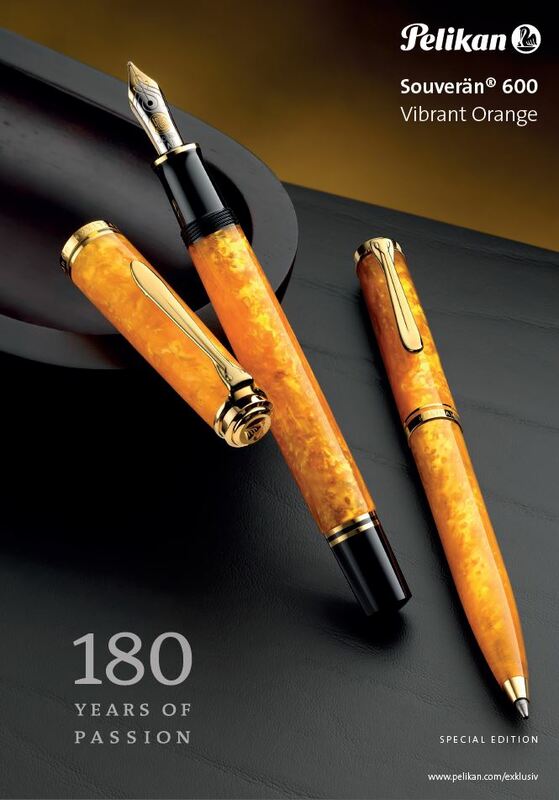 Pelikan’s sales literature notes that the “tones reflect the beautiful transition of colors that autumn brings us.” While the barrel and cap are done in a marbled orange acrylic, the section and piston knob are made from a high quality black resin. 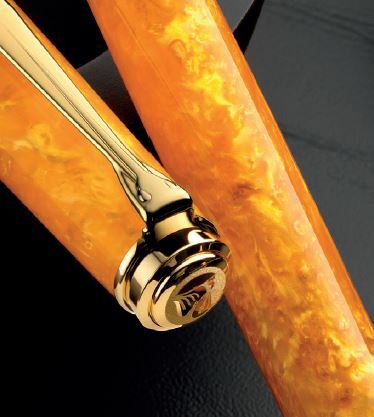 The furniture will be 24 carat gold-plated and includes Pelikan’s standard dual cap bands, dual trim rings on the piston knob, and a single trim ring on the section. The clip is the classic pelican’s beak style and the nib will be two-toned 14C-585 gold. Available widths will include the standard sizes of EF, F, M, and B with the EF nib carrying a premium when purchased from the European Union. In addition to the fountain pen, there will be a matching ballpoint available. There is no word on pricing in the USA as of now. The MSRP in Germany, including VAT is €390 for the fountain pen and €285 for the ballpoint. I would therefore expect overseas vendors to sell the fountain pen for anywhere from $350-380 to US customers when you deduct for the VAT. There will be some variability of course between retailers depending on the region and any coupon codes that may exist. That seems to be similar to recent past releases. Of course, only you can decide if the pen at that price is a good value. You can likely expect to pay more if purchasing from a domestic vendor though you would also then be covered by the warranty, something you forego when purchasing overseas. Personally, I have been waiting for the splash of color that this one has promised to bring to the flock. I think that it will go quite well with the M600 Vibrant Green that Pelikan released back in 2014. I just wish the company would be more aggressive with colors like this on a larger scale rather than a release here and there. To me, this is where the excitement is. What are your thoughts on the Vibrant Orange and will one be findings its way into your flock? I’ll be getting one of these to go with my orange M320 and my nice collection of M600 nibs. The 320s had some great finishes so it’s nice to see some of them come to more substantial pens. The M3xx is the one that I find too small to use comfortably. I’m in. I’ve been looking for a bright orange pen for some time, and have never found a reason to purchase. Love my Pelikans, but I have no experience with the Pelikan EF nib. This may be the first. Now seems like a good time. There is some variability with the EF. I have had some true EFs and others that are a bit wider, more on the F side. Lately it seems they’ve been a bit more true to their designation but your mileage may vary. It’ll be hard to pass up. When I saw the “orange” title, I thought, “oh good, I won’t be interested and my credit card gets a pen breather.” However, the photo immediately changed my mind, at least initially. I like it. Might need a bottle of Yu-yake to go with it. I was not familiar with that one. May have to check it out. Looks like a nice orange and I’m a big fan of Iroshizuku. I’m jealous of your restraint. Is this not more yellow than orange? Hard to tell in these images. Its probably a mixture. I rely on the pre-release photos not at all. Will have to wait to see in real life. That said, if you look up pics of the Orange M320 from 2004, you’ll get a pretty good sense of what to expect with this one. I must have one! My Orange M320 needs a big sister. To me this is more yellow than orange, but I’m not going to quibble over the color name. I love this pen; what a cheerful color to bring out in November! This will make an awesome addition to my other three M600 pens; pink, white, and turquoise. I hope Pelikan continues to bring out cheerful colors in this line. Your flock is growing nicely. This would make a great addition. It looks vibrant, to be sure. I passed on the vibrant green, and I think I’ll pass on this one. The 600 green o’ green is a favorite; an orange version of that (or a 600 burnt orange) would have been more tempting for me. I love the Green O’Green as well but am having a hard time visualizing that finish in orange. I really like these vibrant editions they put out from time to time but I guess that’s what is nice about the variety that Pelikan puts out. Something for everybody. These look like they are ripe for squeezing. LOL. I do wish the cap was black, though. I really like the contrast provided by the black piston knob and section. I think a black cap would have been too much. I think they struck the right balance to appeal to my taste. You could always get this one and swap it out with a standard black cap if it made that much of a difference for you. Yes, I don’t know who does their product photography but they are certainly heavy handed with photoshop. We will add your technological distinctiveness to our own. Although I’m Japanese, I feel I’m obliged to say “PILOT is irrelevant, SAILOR is irrelevant, PLATINUM is irrelevant”, and I must surrender myself to the Pelikan’s “splash of color”. I wonder if the “premium” on the EF nib means that it will now actually be an EF. Pelikan nibs over the last few years have run about a size wide. I don’t think the premium price affected the nib in any material way. The premium is just a way to keep vendors selling to other markets. That said, the last several EFs I’ve gotten have been more true to their designation. Still a bit hit or miss. A really beautiful one, also in comparison to other vibrant tipes, which appear in the past. I owe also an Aurora bright orange (Mar Ionio) which gives a bright color the soon it will be touched by light or the sun. I will go for it. I’ve always admired the Aurora. I think this one looks a little lighter and brighter. Would love to see a side by side once released. I love contrast personally so the black really makes the orange pop for me. Different strokes for different folks though. Doesn’t this look similar to Aurora’s beautiful Sole (sun) finish? But beauty is always in the eye of the beholder. What looks great in an Italian pen can look a little over-dressed in the German equivalent. For what it is worth, I love it. Similar indeed but Pelikan first employed this finish back in 2004 which I believe predates the Sole. I’m liking it alot, but then, I’ve lusted after the M320 version for years but never paid so far up for one. Now I don’t have to. Ordered, with a B nib for max possibilities from a nibmaster. I struggled with what nib to get for the same reason. I had a B selected but backed it off to an M. Enjoy your new pen! I LOVE the color I just wish they have blended it with something else to make it more interesting when capped. The contrast when the black is visible (uncapped) is best! I don’t disagree but not sure what else they could have done with the cap. It’s beautiful but if it is not transparent, and lacking an ink window, I’ll have to pass it up. One of my favorite features of any Pelikan is seeing the ink level at all times. For this reason I will also pass on the stone garden. I am over-joyed with my M815 Metal Striped and I am eager to get the M205 Olivine. So it’s not all a loss this year. It does lack an ink window but I do believe the material will be somewhat translucent when held up to the light to allow for viewing the remaining ink level. That’s the way the M320 was. Glad you like the M815 and the Olivine is one of my favorite special edition inspired by the IOTY series. A bright orange rollerball – absolutely in my collection!! I agree, the “vibrant” edition are some of the most eye catching and appealing, at least to me. The Fritz Schimpf website has a real life photo, and the pen appears semi-transparent. It is shown capped, and the piston knob and lower trim rings are visible through the orange acrylic. Yes, I believe this is indeed the case. Hi, Joshua. I’ve been reading your posts for a while now but this is my first time commenting. I just received my vibrant orange today. The body is definitely translucent enough to be able to tell the ink level. I’m usually a blue pen m800 person and own a vibrant blue as well and although they both have the name vibrant, the look is quite different. Vibrant blue has shiny fragmented sheets within the blue and you can see the shiny specs all around whereas vibrant orange has a liquidy, kind of melted candy shining whithin and the shiny part is limited to two sides (at least the birdie that arrived at my home is like that). I was a bit disappointed to see that when you look at the pen from the side, you don’t see the shine but a dull flat orange. I REALLY needed a smaller bird for quick note taking so I’m sure I’ll end up loving it and it did prevent me from opening up my purse for the Stone Garden (damn! If I’d known earlier that THAT was coming …). Sorry for the lengthy post. I’m jealous. My Vibrant Orange is in the mail. Usually takes my pens 2 weeks to get to me via the post sonhwopfully I’ll have it by next week. Like the Stone Garden, I intend to review this one once I have it. Thank you for your first impressions. I look forward to comparing it with my M600 Vibrant Green and M805 Vibrant Blue. Enjoy your new bird!